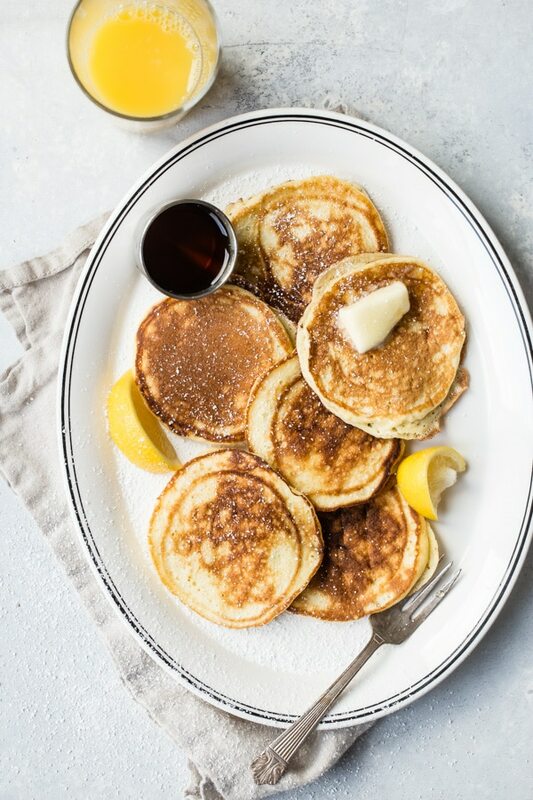 When life hands you lemons, there’s only one thing to do: make Lemon Ricotta Pancakes for breakfast. They’re delicately lemon scented, light as air, and make every day a little sunnier. Make them as-is, or add blueberries for the best weekend ever. Who here is tired of pancake mix? Raise your hands. 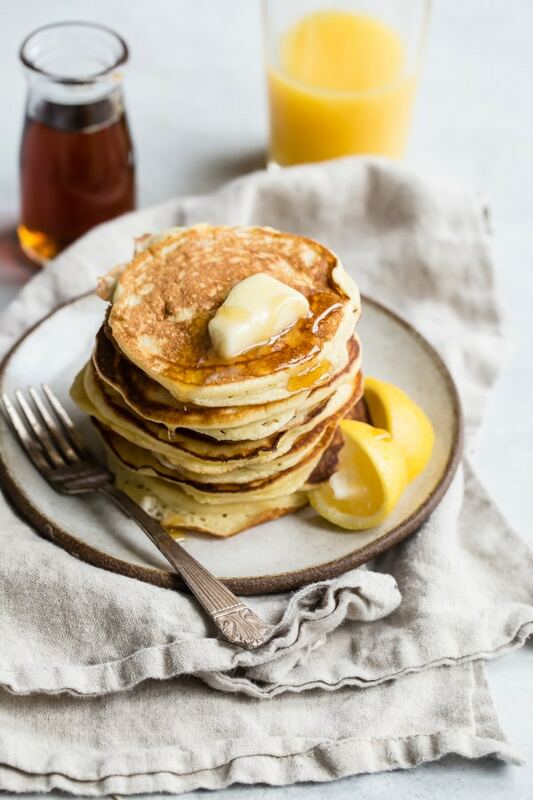 This recipe for Lemon Ricotta Pancakes is the antidote to all your leaden, tough-as-nails flapjacks. They practically float off the plate, and like clouds, they’re excellent at disappearing. 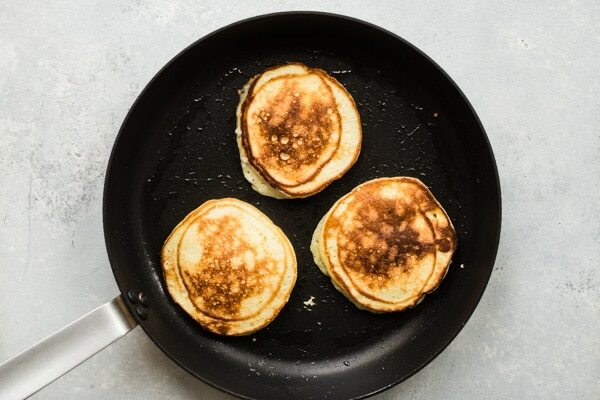 What’s the trick to making fluffy, airy pancakes? I learned that it’s separating the eggs. 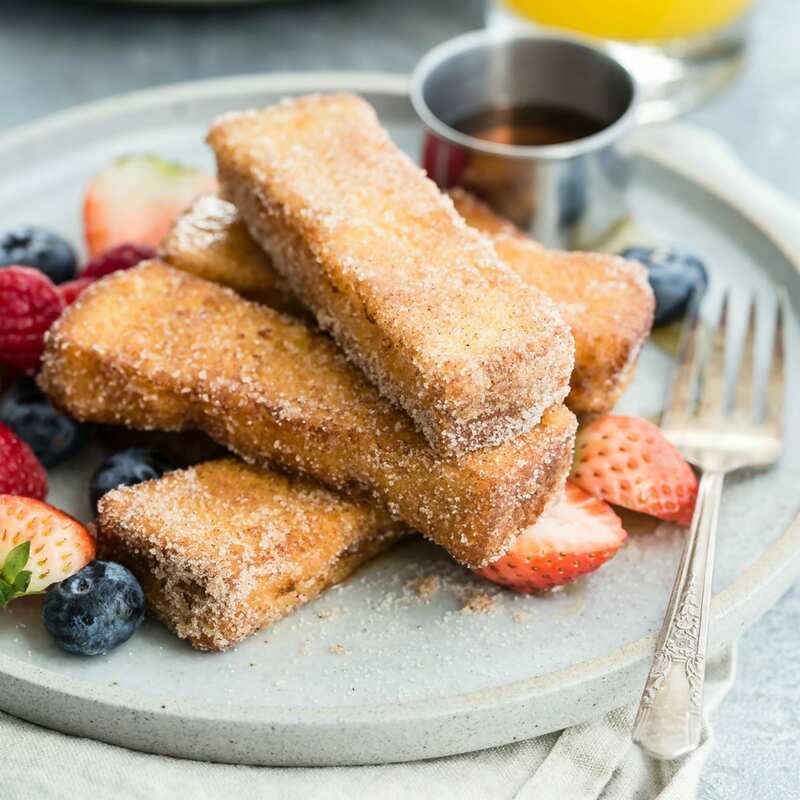 When you beat the whites separately and fold them in to the batter, you get lofty cakes that are light and delicious every single time. Who knew that just one extra little step could make such a huge difference in pancake texture? Now let’s talk about the lemon and ricotta. I’ve been making my own homemade ricotta cheese lately, and these beauties are just the thing to help me use it all up, so I can make some more. The ricotta cheese adds a creaminess to the pancakes that reminds me of a custard. Every bite is as soft and moist as can be, but with crunchy edges. It’s really something. If you’ve never made fresh ricotta before, but are willing to try, head over to my easy how-to. It’s so much easier than you think to make this delicious cheese. Grab some milk and squeeze some lemons–that’s about all you need. But before you juice them, won’t you please zest them? Add that zest to the pancake batter! Serve the cakes with fresh blueberries, blueberry compote (recipe down below! ), or my Homemade Pancake Syrup, which is a fabulous recipe I learned in culinary school. 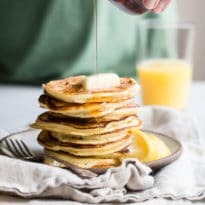 Making Lemon Ricotta Pancakes for 2? Click and slide the number next to “servings” on the recipe card below to adjust the ingredients to match how many you’re feeding—the recipe does the math for you, it’s that easy. This is a guide for visual learners! The full recipes is below, in the recipe card. In a bowl, sift together the flour, baking soda, salt. Make a little well in the center of the four, and drop in the ricotta, lemon juice, lemon zest, milk, egg yolks, and vanilla. Stir until just barely combined. Don’t forget the vanilla! Then add the melted butter. It helps to have a standing mixer or a hand-held mixer to beat the egg whites. Whip them, at gently increasing speed, until they’re soft and billowy. Add the sugar (only if you want it) and whip until the mixture is glossy. Fold the egg whites into the batter, a third at a time. Be careful not to over mix. Now the batter can be dropped into the hot, oiled pan. It’s okay of they look a little lumpy. Cook the pancakes about 2-3 minutes on each side, flipping when the edges of the pancakes are set and deep golden brown. I keep a baking tray in the oven at a low (200 degrees) temperature to keep the pancakes warm until everyone can eat. Or you can cook ‘em up restaurant style and let them fend for themselves. 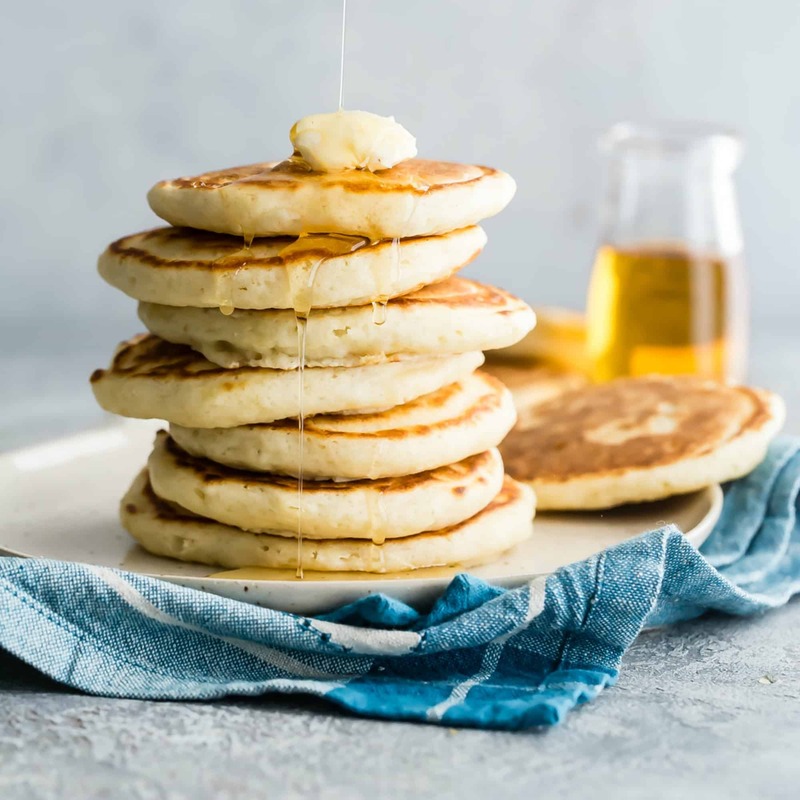 It’s easy to make these pancakes GF when you switch out the all-purpose flour with almond flour or your favorite gluten-free flour. Ricotta cheese is already gluten-free, just in case you’re wondering. Blueberries and lemons go together, so why not make lemon ricotta pancakes with an easy blueberry sauce? Remember that bag of frozen blueberries you’ve been saving for smoothies? In a small saucepan, mix together the water, sugar, and lemon juice with half the blueberries. Cook on medium heat for 8 minutes. Add the remaining blueberries and cook another 8 minutes. This keeps some of the blueberries whole, while the others break down somewhat. Serve warm. How do you make Lemon Ricotta Pancakes with Blueberries? 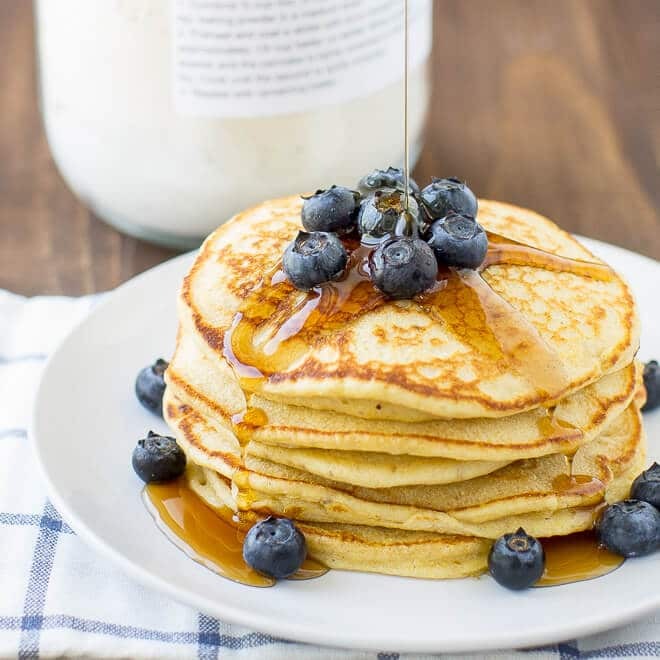 By all means, if you must have your blueberries inside the pancakes, throw a handful of frozen blueberries straight into the batter, or place them strategically into each pancake as soon as you spoon the batter onto the pan. They’ll cook as the pancake cooks. Where is ricotta cheese at the store? The age-old dilemma: finding ricotta cheese. I always end up looking way too long. Ricotta is commonly shelved in the dairy section, next to the cottage cheese, sour cream, and dips, away from the blocks of cheese. Of course, now that I make my own, I just grab a gallon of whole milk. Good luck! 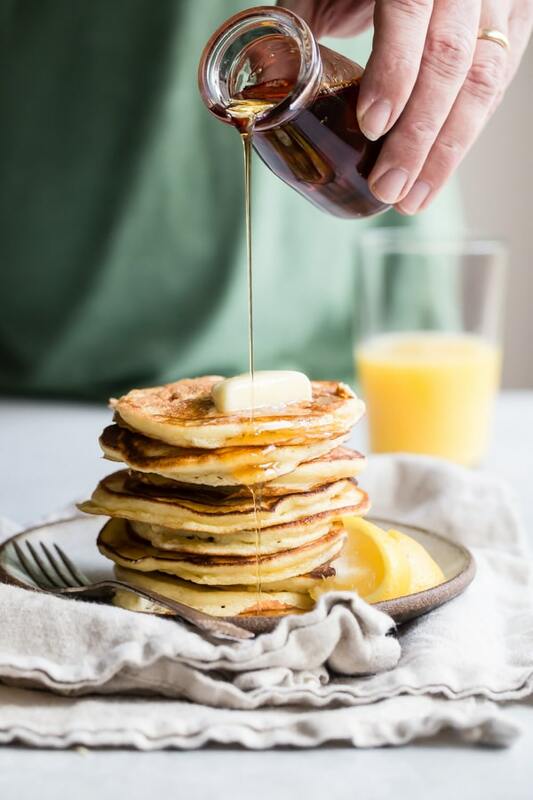 When life hands you lemons, there’s only one thing to do: make Lemon Ricotta Pancakes for breakfast. They’re delicately lemon scented, light as air, and make every day a little sunnier. Preheat oven to 200 degrees. Line a rimmed baking sheet with foil for easy cleanup. Top with a wire rack and coat with nonstick spray or vegetable oil. Set in oven. 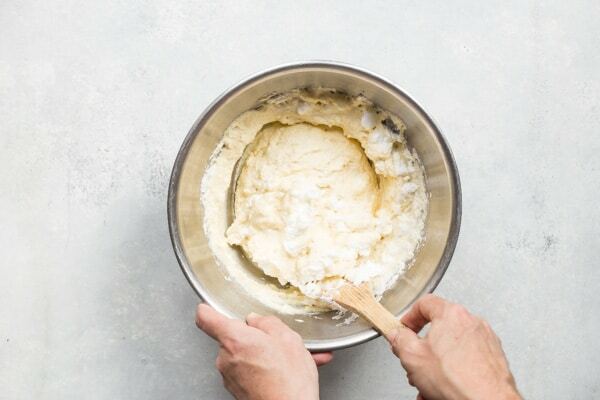 In a medium bowl, whisk together flour, baking soda, and salt. Make a well in the center. Add ricotta, the 2 egg yolks, milk, lemon zest, lemon juice, and vanilla until just combined. Gently stir in melted butter. 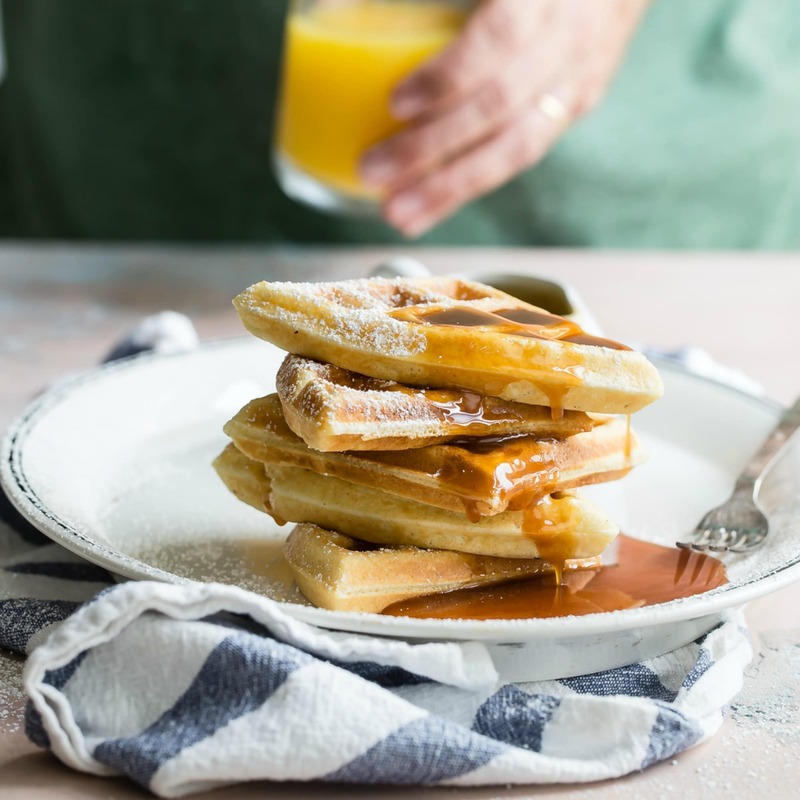 In a standing mixer fit with the whisk attachment, or using an electric mixer, whip the 4 egg whites on medium-low speed until foamy, about 1 minute. Increase speed to medium-high and whip whites soft and billowy, about 1 minute. Add sugar and whip until glossy, stiff peaks form, about 1 to 2 minutes. Add 1/3 of egg whites to batter and fold in gently until incorporated. Fold in remaining egg whites. In a large nonstick skillet over medium heat, heat 1 teaspoon oil until shimmering. Wipe out oil with a paper towel, leaving a thin layer on the bottom of the pan. Using a 1/4-cup measuring cup or a 2-ounce ladle, add batter to skillet. Gently spread each portion into a 4-inch round. Cook until bubbles start to form in the batter and the edges are set and deep golden brown, about 2 to 3 minutes. 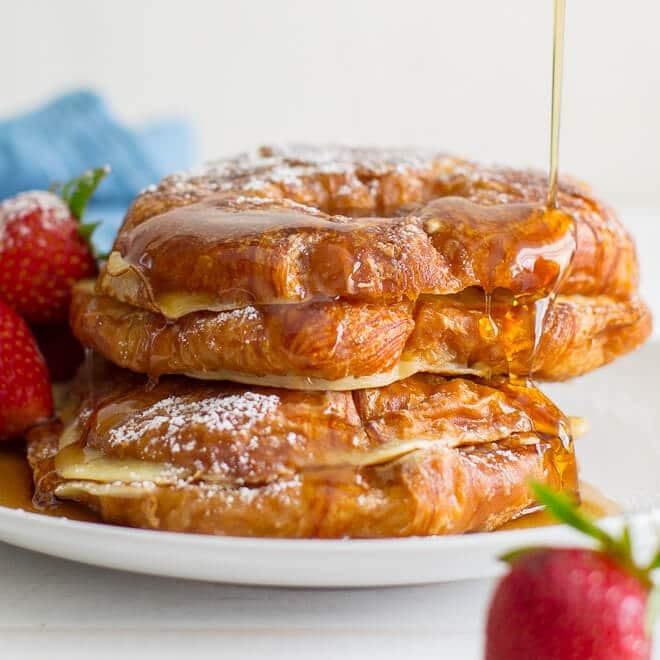 Flip pancakes and continue to cook until the second side is golden brown, 2 to 3 minutes longer. Transfer to prepared rack in the oven to keep warm while preparing the rest of the pancakes. Cook the remaining batter, adding more oil as necessary to the skillet. 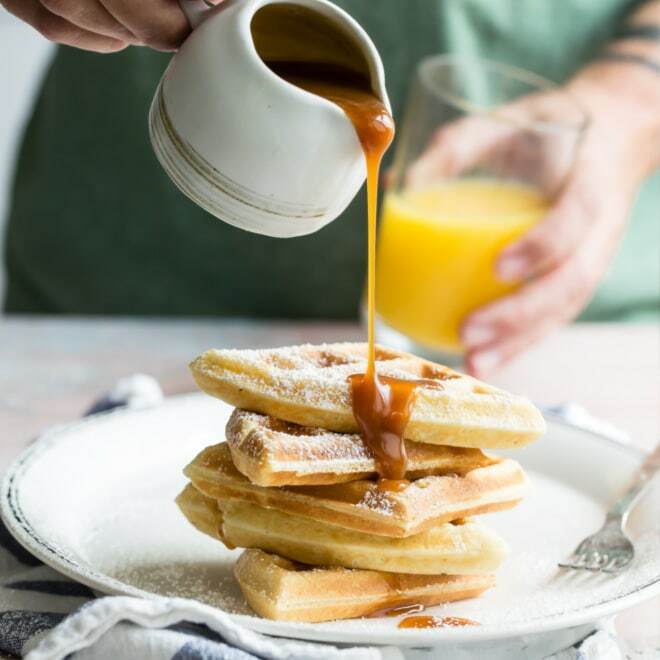 Serve warm with butter and syrup or blueberry topping.